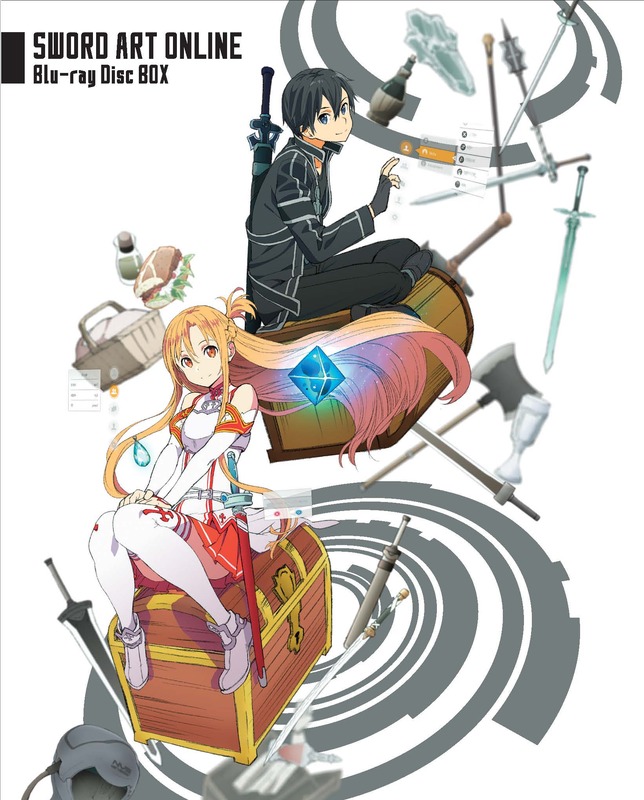 The mega-hit anime series “Sword Art Online” returns in a complete first season (episodes 1-25) Blu-ray box set which includes Extra Edition! In the year 2022, a next-generation technology known as "NerveGear" has been developed, making Full Dives into a virtual dimension possible. The world's first true VRMMORPG utilizing NerveGear known as "Sword Art Online (SAO)" has generated worldwide buzz, and on its official launch day, one player, Kirito, immerses himself in its virtual world. Special Features: Audio Commentary by Creators and Japanese Cast, Textless Opening & Ending (Aincrad Arc), Textless Opening & Ending (Fairy Dance Arc), Special Short Animation “Sword Art OFFLINE” , Original Web Previews, SAO English Trailer, SAO II Teaser Trailer. *Special Features subject to change. Whether or not you like Sword Art this is a fair deal considering how much Aniplex's volume releases are. Don't blame rightstuf for price gouging. They are the cheapest way to purchase anime. The other reviewer needs to relax. You save $120 for getting the same Blu-Ray Discs individually, so there isn't much to think about. I'm glad I can support Aniplex with this release. Compared to other collections like the Madoka Magica Box that barely zeroes out if not for a few extras, this is a great release from Aniplex. Here's hoping they come out with a box set with SAO II (1-24) + Ordinal Scale next. 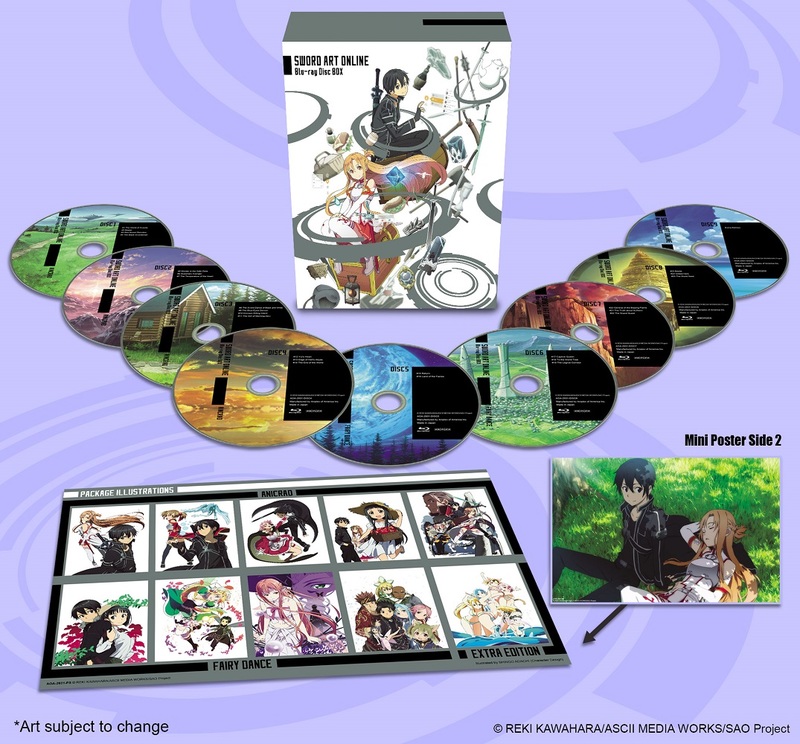 Sword Art Online returns in a complete season 1 box set! I really disliked the SAO LE sets. A 2-cour show having 4 box sets was ridiculous. But thankfully this is a different story. This is the complete season 1 plus Extra edition released in one set. The outer box is a see-through plastic, though a bit strange it isn't bad as it may longer than a chipboard box. Next are the Blu-Rays. The set includes 6 discs images redesigned to the scenery from the show with 5 episodes evenly divided unto each disc with the extra episode on the last disc. Also it comes in a digipak with the Asuna/Kirito promo image which is a downfall since it’s made from a cheap material more prone to damages. Lastly it includes a small booklet explaining the show and the characters. Overall this is a set that SAO fans will enjoy. Sure it’s still expensive being $160 but I think it’s justifiable. Aniplex has really lowered their prices comparing to the standard edition being $240 and the LE being $360. LOVE THE SERIES AND THE THE PRICE IS HIGH. IM GLAD ITS CHEAPER THAN BEFORE IM MORE LIEKLY TO BUY THIS BOXSET NOW. For the complete first season plus extra edition (which is movie length in itself). On Blu-ray for $159. That's a really good price for Aniplex. Considering the price of all the box sets by themselves. I just bought season 1 part 1 for $60 and then this drops. Ugh! $120 savings half gone. Oh well I'll find a buyer and get this box set. Love this show! I just hate how I paid $220 just a few months ago for this series just for them to make a cheaper box set :( Very good deal for anyone who was smart enough to wait! Awesome series - and almost affordable now. Loved loved loved this show. Haven't bought it before now because of Aniplex's OUTRAGEOUS individual volume pricing. Unfortunately, they own some of the best series out there - this, Bakemonogatari, the new Fate series (Zero and UBW) - all priced absolutely in the stratosphere compared to most other releases from other companies. Not Rightstuf's fault - love them (and their highly affordable non-Aniplex titles) to death too. This is finally a reasonable price - so I'll buy it - already know I'll love it. Screw the limited editions, I've been waiting for a consolidated version. Now to wait for Season II to receive a box set as well! Just like with everything else Aniplex does, it's overpriced garbage. Their shows tend to be good, but not so good to warrant $200. ESPECIALLY with their hilariously cheap and shoddy releases. But of course, the shills will FERVENTLY defend Aniplex with their lives if they have to (even if you got this from them for free, it still isn't worth it). Any rational and intelligent people, however, will just buy a region free blu-ray player and import a few shows (like this one) from Amazon UK, or Zavvi and recoup the investment for the price of a SINGLE AoA release. Happy to see AoA is FINALLY releasing a FULL Blu-Ray release of Sword Art Online instead of those $70 pieces of the series-- But just the same, I'd much rather wait for the less expensive DVD set thanks. Blu-Ray sets are nice but the price is NOT. The show is great, the price is not and thus it gets a one-star. Someone in the comments sections said not to blame RightStuf for the pricing, and I agree, instead I blame US anime fans for the pricing. As long as people are foolish enough to buy this then the company that is bringing it over here will continue to charge this much for the stuff. I spent some time overseas and saw these same sets for literally a quarter of the cost, problem is they were all region coded to prevent sale in other countries, especially the US. As a true anime fan don't support the price gouging of Anime, blackball this item to drive the cost down and tell anime importers that we expect fair price for all our anime. This set alone should not be worth more than 50 bucks. Honestly would you pay 150 to 200 for a season of Game of Thrones? FINALLY A CHEAPER OPTION, BOUT TIME ANIPLEX! Honestly, It includes all 25 episodes and bonus thing but you can just watch it in netflix for free not having to pay 160 dollars. I love SAO and I love right stuf. It is a great deal there are 4 volumes each sold through Aniplex totaling 180+40 for the Extra. So 220 for the regular blue rays through aniplex. I wanna thank the rightstuf team for always bringing me good deals. Math says you're wasting money during manufacturing and your customers pay for it. by Connor Maynard: Massive fan. For that price you should be including season two, in addition to Offline and Extra Edition. That's also an excessive amount of discs, that's probably where you're losing money/what is bumping the price up. You should be able to put all content in the box set excluding the movie, for the same price, 9 blu ray discs (8.56 actually) could hold all of SAO in Blu ray quality/format and that's without any compression. If that were the case I would pre order and the patiently wait for an Ordinal Scale blu ray to add to the collect but as it stands it's not worth the money so I cannot justify the purchase. I am so ready to by this, even though i already bought box set 1 on blu-ray last year. Now if only they would release the complete collection on DVD! Other people can't do simple maths. The set arrived earlier than expected, and the packaging is great! I've never owned the SAO blu-rays, and every time I tried to justify spending over $100 for just one season I just couldn't do it. This is definitely more affordable than buying everything separately! Nice packaging but wished they included more extras since it was pretty expensive.